Seagate has just announced a thinner and lighter 2.5in hard drive that it hopes will find its way not only into slimmer Ultrabook computers, but also into Android and Windows tablets. The simply-named Seagate Laptop Ultrathin Hard Drive is only 5mm thick and weighs about 93 grams, yet it has a capacity of 500GB that will allow slim computing devices to carry much more data internally than they previously could. 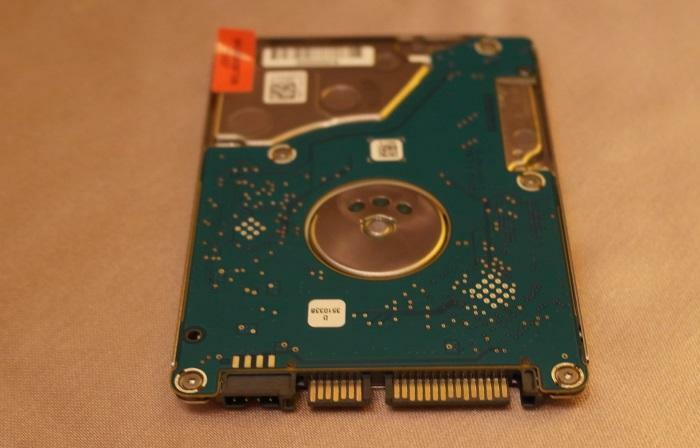 The new hard drive retains the same 2.5in form factor of thicker notebook hard drives (7mm and 9.5mm). Importantly, it doesn't have a proprietary interface. It features a standard SATA interface and can be placed in any current computer; however, it has been specifically designed to be installed in new Ultrabooks and hybrid devices, in addition to tablets. It's Seagate's first real foray into the tablet storage market; previously, Seagate only had its wireless external hard drive products in this space. It may be thinner and ligher, but it still has a standard SATA interface. Seagate's senior vice president and managing director for the Asia Pacific region, BanSeng Teh, said that the tablet market will be able to benefit from a drive like this because it has a lower price point than solid state drives and offers a lot more capacity. Seagate's Teh said that the proliferation of user-generated content, and advances such as ultra-high-definition movies, will create demand for high-capacity integrated tablet storage that solid state drives simply can't deliver in terms of manufacturing (currently, at least) and especially price. When addressing the comparisons between this new hard drive and solid state drives, Mr Teh pointed out that the 5mm mechanical drive is not meant to replace solid state drives in the market, but instead to add to the storage options that are available to tablet and Ultrabook manufacturers, in particular to those manufacturers wanting high-capacity storage and a competitive price point. The performance of tablets featuring the drive would depend on whether device manufacturers opted to include a portion of flash-based cache storage in addition to the hard drive, for example. The slimness of the new drive should theoretically allow vendors to come up with thinner, more innovative tablet and hybrid Ultrabook designs, while at the same time meeting inexpensive price points that consumers have come to expect. Fitting a hard drive such as this into a tablet is no mean feat thanks to its 2.5in form factor, which means that vendors will have to decide on what other features or components they want to sacrifice in order include it, but Ultrabook and hybrid vendors should love the flexibility that it brings. The new 5mm drive is on the right. 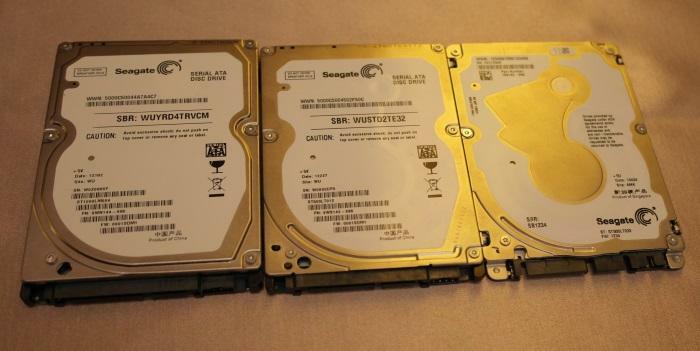 Here you can see the dramatic difference in thickness between the 9.5mm, 7mm and 5mm drives. A mobile phone battery used for scale. Seagate showed off a very thin prototype tablet featuring the new 5mm drive at a media briefing in Computex, but it wasn't willing to go into the details of that tablet; it was merely showcasing that thin designs could indeed be achieved. Currently, the vendors that have embraced Seagate's 5mm drive include the ever-innovative ASUS, and Lenovo and Dell. 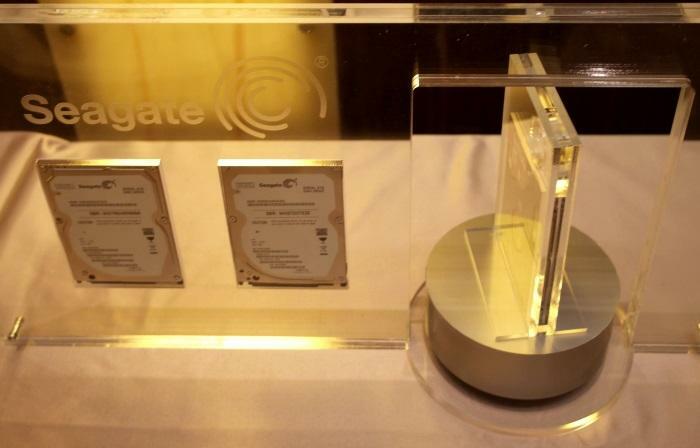 Seagate says that new devices featuring the slim drive should start appearing by the end of the year. The new drive is slightly more energy efficient than the company's 7mm hard drive, and also offers the same performance characteristics as that hard drive. On the inside, the 5mm drive uses the same platter size as Seagate's 7mm drive, with some changes to the other internal components. As such, achieving the areal density needed for this drive was not a problem, but making the drive rigid, shock resistant and curbing vibrations was. To make the drive more rigid and robust, Seagate has used a steel base, which adds more strength than the aluminium that's used in thicker hard drives. To prevent data loss in the event of a drop, a zero-G sensor has been implemented to park the heads. In terms of heat, Seagate says the 5mm drive won't put out too much and that it's slightly more power efficient than its 7mm drive. The way the drive is enclosed in a device, and what type of system cooling will be implemented, will be largely up to the tablet and hybrid device manufacturers. While Seagate's direct move into the tablet market could be seen as a further indication that the growth in the PC market is slowing, Mr Teh said Seagate's own research shows that the PC market will actually continue to grow. Mr Teh said that growth in the PC market had slowed "because people have choices". He went on to add that Seagate's research "shows that people who use a tablet or a smartphone as a compute device actually still want to buy a PC or want to upgrade". IDC research also predicts a higher uptake of Ultrabooks in the second half of this year. At this stage, the drive is only slated for use in tablets and Ultrabooks (including hybrids), and won't be available for end users to buy on its own. It might also be used in external hard drives in the future. The author of this article was flown to Computex in Taipei as a guest of Seagate.